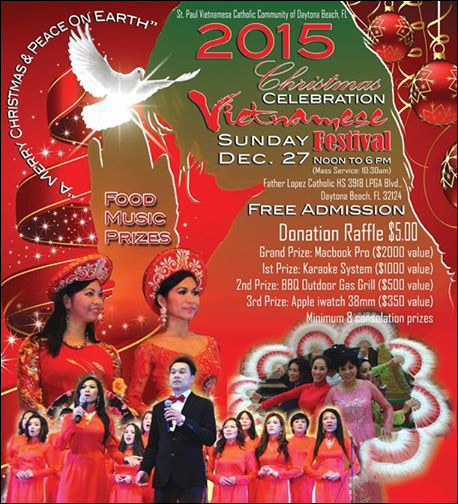 The Rice & Rose Law Firm is a major sponsor of the 2015 Vietnamese Christmas Festival presented by the St. Paul Vietnamese Catholic Community of Daytona Beach, Florida. The greater Daytona Beach area has a large and vibrant Vietnamese American community. Several members of our community were Vietnamese “boat people” or refugees who fled after the Vietnam War. Their life stories are amazing, and this Festival is an opportunity to celebrate their heritage and enjoy their culture and food. We invite you to attend the Festival which will be held on Sunday, December 27, 2015, at Father Lopez High School at 2918 LPGA Blvd. in Daytona Beach.